Snacks do more than tame hunger – they provide nourishment for your body. Learn to build a balanced snack, plus five smart snacks for everyday eating. Do visions of crackers, chips or pretzels fill your head? Or maybe you think about nuts, beef jerky or a piece of raw fruit. Snacks, or mini-meals as I prefer to call them, can play an important role in your daily meal plan. Not only do they help tame hunger between meals, they also contribute to your daily intake of vitamins, minerals and fiber. That is, if you choose the right foods. According to a recent Nielsen survey, the sale of snack foods are booming worldwide, with Europe taking the lead in dollars spent. But the dollar number alone doesn’t paint the whole picture. Consumers are spending more, but not necessarily buying more. Today’s consumer is willing to spend more on snacking – but why? Is it a demand for higher quality food, a greater focus on health, taste or that consumers are willing to pay a little more for convenience? Whatever the reason, it’s clear that consumers love their snacks . That’s why I’m sharing this post today. If you are going to snack, make sure you choose one worth consuming. 1.) Choose at Least Two Macronutrients – It should include at least two, preferably 3, of the macronutrient’s carbohydrates, protein and fat. Carbohydrates, proteins and fats are all important, but they all have different roles in the body. Carbohydrates provide fuel, not only for working muscles but also for your brain. Proteins provide the amino acids needed for the structure, function and regulation of the body’s tissues and organs, but it also helps you to stay full until your next meal. The body needs a certain amount of fat to function, but as part of a snack, a small amount provides flavor and helps to keep you satisfied until your next meal. Trying to pair a protein food with a carbohydrate is a big step in smart snacking. 2.) Load up on Micronutrients – Snacks should contribute a decent dose of vitamins, minerals, fiber and phytonutrients. In fact, for children, older adults and those of you following lower calorie meal plans, it’s almost impossible to meet your daily nutrient requirements eating three meals alone. High-quality snack foods are needed to meet your daily nutritional recommendations. When building a snack, think about how it is contributing to your growth, development, health and hunger. Not just your hunger or boredom. 3.) Keep it Portion Controlled – Keep the size of your snacks between 200-400 calories – depending on your specific needs and goals. If you need fewer calories, don’t eliminate a food group, just decrease the portion size of the snack so that you still get a good variety of nutrients. For example, someone that needs fewer calories might have ½ turkey sandwich and ½ banana as their afternoon snack while someone who needs more would eat a whole turkey sandwich and a whole banana. Or, someone sticking to a lower- calorie meal plan might choose reduced-calorie bread, while someone who needs more calories could choose a heartier variety. Sandwiches – the bread is the carbohydrate, the meat is the protein, and if you load on the vegetables, you increase the vitamins, minerals and phytonutrients even more. Try this ~300 calorie Turkey and Swiss – and learn more on why I say yes to sandwiches. Cottage Cheese Parfait – One of the easiest snack ideas is build a cottage cheese and fruit parfait. Granola and fruit offer a wide variety of nutrients, including carbohydrates, and the cottage cheese is the protein. 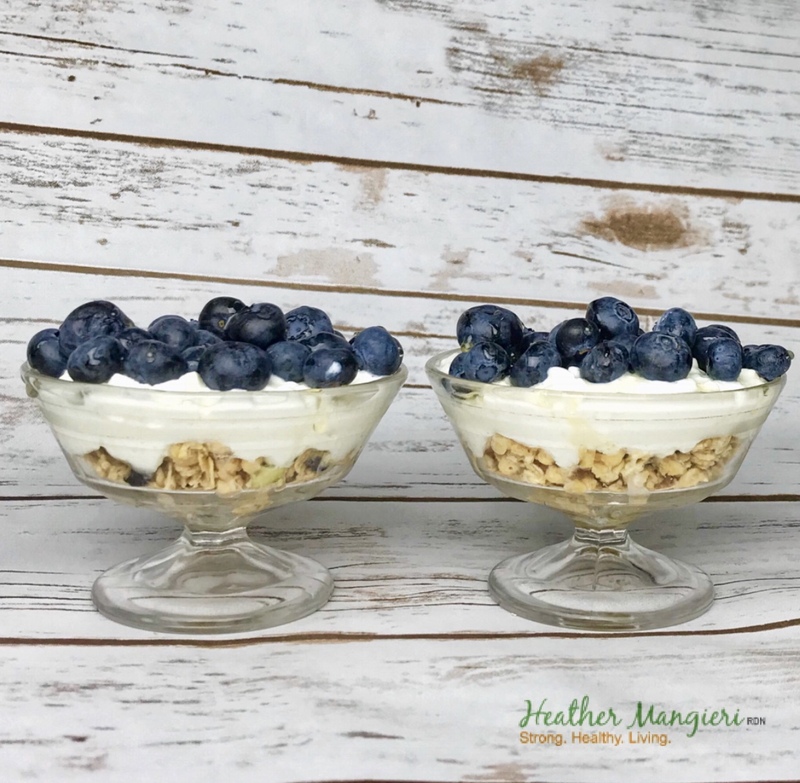 Get the nutrition inforamtion for this snack and see other ways to pair cottage cheese by reading Five Delicious Ways to Eat Cottage Cheese. Trail Mix – Most trail mix recipes don’t make the cut for a balanced snack because the fat content can be so high. My trail mix recipe is made with balanced eating in mind – with the protein, carbohydrate and fat content in the ratio you want to fuel your mid-day hunger. Smoothie – A smoothie, built balanced, is a high-quality, nutrient rich way to fuel your hunger between meals while loading up on nutrients. I have lots of balanced smoothie recipes on my site to choose from, but learning to build a balanced smoothie is key. 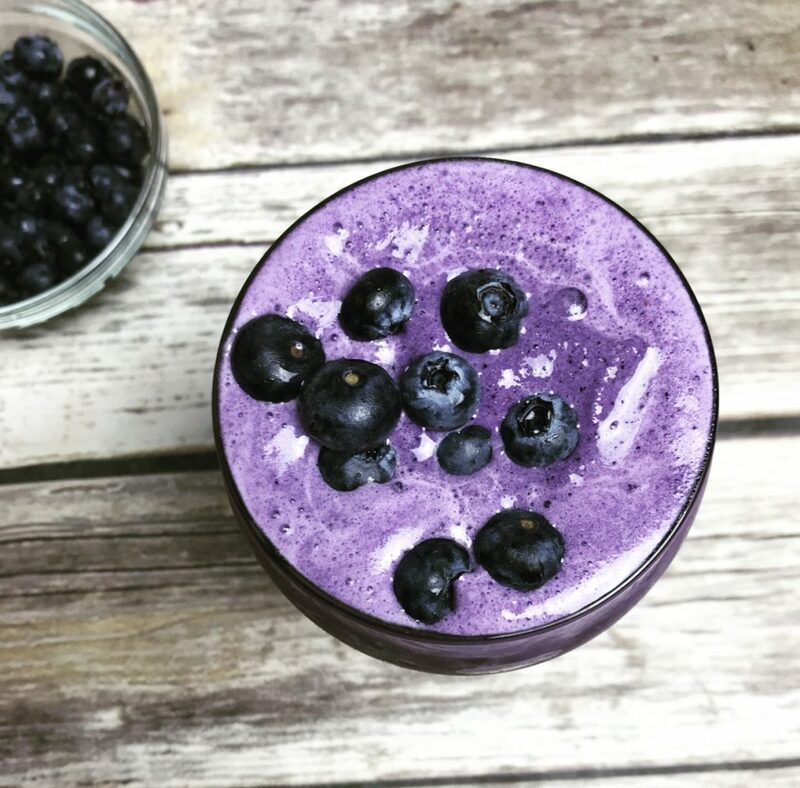 My post on building a balanced smoothie shows you how. Pizza– Mini pizzas are a favorite in my house. Use a flour tortilla, mini bagel, single serve Naan bread or zucchini as the base, then add the sauce, cheese and toppings. This recipe for Zucchini boats is a huge hit with kids or make these perfectly portioned pizza’s in advance and re-heat the next day for a quick snack. So, tell me, what’s your favorite snack?